The aqua colored waters of Lake Huron are beautiful around Flowerpot Island in Fathom Five National Marine Park in Ontario, Canada where unique sea stacks adorn the shores. A large glass bottom vessel named the Great Blue Heron, takes passengers around the area. Here passengers can view shipwrecks at the bottom of Big Tub Harbour and see what lies beneath Lake Huron, but to reach Flowerpot Island, passengers must transfer to a zodiac. The water in Lake Huron/Georgian Bay is extremely shallow making it impossible for larger vessels to near the shore, a zodiac being the ideal type of boat. These sea stacks are called flowerpots as nature has formed them over many years, one being 23 feet high and the other 39 feet. After viewing the sea stacks, passengers can explore a sea cave, the light station at Flowerpot Island and a few of the islands in Fathom Five National Marine Park. The tours to Flowerpot Island run from the middle of May until the middle of October with 2 or 3 trips departing every day. During the summer, the zodiac allows passengers to take in the fresh, air while aboard the open vessel. 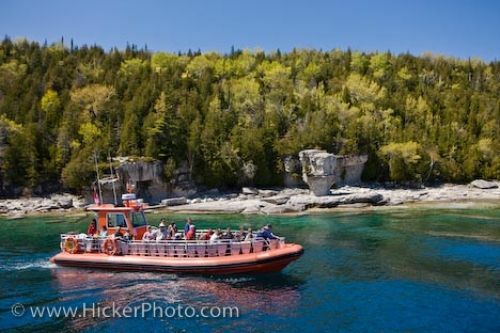 Picture of passengers aboard a zodiac near Flowerpot Island in the Fathom Five National Marine Park in Ontario, Canada. Zodiac off-shore from Flowerpot Island in the Fathom Five National Marine Park, Lake Huron, Ontario, Canada.